On camera, however, IMMORTAL GUARDIAN were determined to avoid traditional cliches and make a music video to remember. To that end, the group – founded by Gabriel Guardian, whose uncanny ability to play guitar and keyboard simultaneously has been showcased on MTV and during a recent guest stint on tour with Powerglove – takes the viewer on an intense roller coaster that spans from the desert to outer space, with an ending twist that leaves the viewer suspended in disbelief. The “Stardust” video is another feather in the cap for IMMORTAL GUARDIAN, whose acclaimed full-length debut, “Age Of Revolution,” was recently on limited-edition blue/black vinyl. (Copies are available via the M-Theory Audio webshop and Bandcamp.) 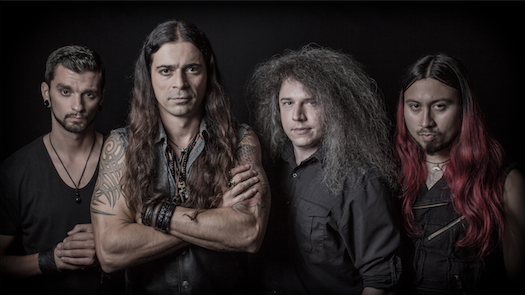 Last month, the group embarked on a national tour with metal guitar icon Marty Friedman (Megadeth, Cacophony). A full list of the tour’s remaining stops can be seen below. Hailing from the same state as guitar greats Dimebag Darrell and Stevie Ray Vaughan, IMMORTAL GUARDIAN proudly fly the flag of musical innovation and virtuosity for the Lone Star State. Over the past few years, the group has released two acclaimed EPs, “Revolution Part I” (produced by Roy Z of Halford/Bruce Dickinson fame) and “Super Metal: Edition Z,” that showcased a full-frontal assault of anthemic melodies, technical rhythms, furious shred and high-flying vocals by Brazilian vocalist Carlos Zema (ex-Outworld). Don’t miss the chance to experience IMMORTAL GUARDIAN and their scintillating brand of “face-melting shred” live!